The La Grande Inn in La Grande, Oregon! 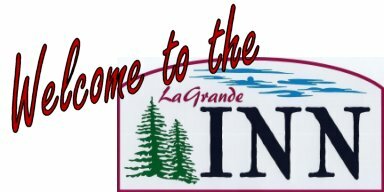 The La Grande Inn is nestled in the heart of the beautiful Blue Mountains and is conveniently located to all major highways. The hotel is close to Eastern Oregon University and Wallowa Lake. Enjoy amenities such as free wireless internet, a seasonal heated outdoor pool, hot tub, guest laundry (for a fee), restaurant and lounge adjacent to the property, exercise room and sauna. Please call hotel for specific continental breakfast items. For reservations, call (541) 963-7195 or click here!